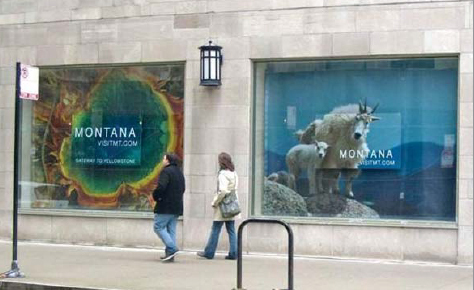 As the Montana Office of Tourism planned for its FY 2010 marketing campaign, the predictions coming in from the US Travel Association were not very inspiring. Across the country, travel and lodging were down significantly with hotel room occupancy dipping to 54.7%. Tourism is responsible for 70% of Montana’s revenue and with visitation down in 2009, the Office needed to reach out-of-state travelers. If most Americans aren’t able to find Montana on a map, how could they be expected to make it part of their travel plans? Even those who knew the state’s location still had the perception that there was nothing to see in Montana. The goal was to raise awareness around the state of Montana and increase visitation over the previous year. Montana is a place people go for a meaningful experience, not simply a vacation getaway. Through proprietary research, the media planning agency identified the target as Geotravelers – the people who look for travel to leave a lasting mark on their lives. This type of traveler is someone who travels for business and certainly has seen a lot in the urban landscape but has a true appreciation for the beauty Montana has to offer. 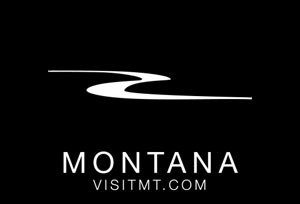 Along with its creative agency partners, the planning agency created a highly-targeted campaign to attract the Geotraveler, bringing the beauty of Montana to their front doors and to locations all throughout their daily commute and business travels. Getting the attention of those with a Geotraveler mindset and inspiring them to visit Montana meant opening their eyes to the world of cultural, adventurous and awe-inspiring opportunities the state has to offer. The campaign let Montana sell itself with big and bold imagery that contrasted with the urban landscape. Picture a massive volcanic pool completely engulfing a double-decker bus, or a 40-foot mountain goat on the side of a skyscraper. Now imagine seeing even more stunning Montana scenery wrapping Transit Authority trains and buses both inside and out, taking up seven full windows of an empty storefront, or zooming through the street you walk by every day, all featuring the tagline VisitMT.com. Whether the Geotraveler took the bus or the train or even walked to work, the plan made sure he/she would see the beauty of Montana. Imagine being able to interact with those visuals – right on the streets of Chicago – learning about all Montana has to offer through awe-inspiring pictures, videos and amazing facts. People did just that with the unit on the side of the Chicago Tribune building that even allowed users to take a picture of them immersed in Montana scenery. The high-traffic spot was perfect for grabbing the Geotravelers’ attention and gave them a virtual experience of Montana. 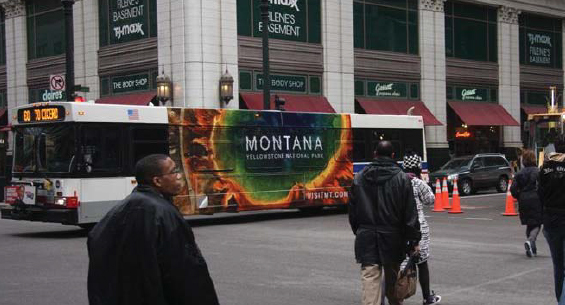 The agency also executed the Montana scenery in cabs across Chicago, using interactive video and picture elements. With research showing that the Geotraveler took more than one trip a year, the planning team secured in-room placement on interactive touch screens in over 2,300 rooms at Michigan Avenue’s Hilton Chicago and the Hotel Intercontinental. The digital format let hotel guests see, hear, and interact with the Montana visuals and the in-room placement created a deeper engagement for viewers. Montana Office of Tourism was the first travel advertiser to use this vehicle. Montana had the highest US hotel occupancy rate in July 2010 and the second highest in August. Montana’s awareness as a travel destination increased 36% and intent to travel nearly doubled over FY09. A reporter from the Chicago Tribune even wrote a counter piece to the ads entitled “Take That Montana!” urging Chicagoans to send in their very own awe-inspiring scenic Chicago photos in order to show Montana who really lived in the more beautiful location. Other press coverage included articles in the New York Times, Seattle Times, Missoulian, and local news stories on WCCO in Minneapolis/St. Paul and KTVQ in Billings. With all of the buzz surrounding the out of home campaign, Montana was able to transcend traditional paid advertising, moving into the highly sought-after earned space. This campaign was also a terrific example of how creative and media can seamlessly work together to drive real results for a client’s brand.